A while ago I was skimming through a fitness magazine at the hairdressers while waiting for the dye to set, and an article about setting goals to keep motivated to exercise caught my eye. One point in that article was, that you should consider your overall situation in life when setting your goals: if you’re a CEO and have to keep a family life rolling, don’t set an exercise goal that requires 7 hours of training a week. On the other hand, I’ve just recently read a couple of inspiring posts about the benefits of setting your goals higher than what seems realistic by Katie from Joy of Languages, and about how joining a language challenge can be a good idea even when your life is as stressful and busy as can be, by Elena from Hitoritabi. All that rings true to me as well. Somehow, I think my goals for learning Swedish last year were simultaneously too ambitious for the time and energy really available, and not ambitious enough, so that in the little study time I had, I wasn’t really challenging myself. I did sort of make a plan in August to start working my way to eventually reach higher levels. I was inspired by the post by Katie Harris about aiming for fluency in French, and I thought I’d want to make my perhaps somewhat lighter version of aiming for fluency in Swedish from my living room. What I did not realise was that somewhat less effort would mean way less progress. I did listen to podcasts and audiobooks, read books and chat with a tandem partner in Swedish – quite regularly even – but I didn’t really challenge myself, I didn’t really do what was difficult. And I certainly didn’t put a lot of time into studying. And so I didn’t really make progress, and my motivation dropped (and then hibernation happened). However, those perhaps a bit half-hearted attempts to improve my Swedish still taught me something important about my current level and what it will take to make progress. I realised the inevitable truth: I really am sitting firmly in the intermediate plateau, and the way I was practicing last year won’t be enough to get me out of there (within the next 20 years at least). So now, thinking of what my goals for this year should be, I know I’m going to have to be more specific, more systematic, and more ambitious. And at the same time, more humble and realistic. It doesn’t help to assume that your progress will be as fast as it has been. You should think what is especially difficult, and work on that. I won’t have too much time for learning Swedish (I can’t dedicate as much time to language learning as I’d like to, and I’ve decided to focus on Russian). But I still really want to work with improving my Swedish. So I’ll just have to accept that it will be slow. And I’ll have to identify some specific areas that I find difficult in Swedish, and set some goals related to improving those. Now, following the advice of Kerstin, I tried to think what I’m most frustrated about in Swedish right now. First of all, it’s clear that speaking is the area I want to improve the most. My reading and listening are pretty much somewhere in the C levels already. With listening, I’ve had problems mainly just when I’m with a group of natives and try to follow their conversation. My reading skills I even dare estimate to be on level C2. An “I can read and understand the main points of a text about sustainable public procurement in Danish because my Swedish is so good” kind of a level. But speaking… That’s where the biggest frustration lies. But what about it exactly? My tandem partner keeps asking me, what is it I want to improve, because he finds I speak well enough to get by anytime. But for some reason, I’m not happy. The thing is, I’m not really able to discuss anything of particular interest to me. I can discuss general everyday matters with ease, but if I try to explain about my job, my volunteering, why I love learning languages, or anything like that, I find that I express myself very clumsily and lack the necessary vocabulary. That is something I think I want to work on next. When it starts to feel easy, pick another topic and start specialising on that one. That approach somehow resonated with me and it’s been on my mind a lot lately. It seems like exactly what I want to do with my Swedish right now. But there’s one problem: I don’t really know for what I would be learning all that! The thing is, I am learning all my languages mainly out of linguistic fascination. So I have no practical reasons to learn to talk about scouting or language learning in Swedish. I only have a few Swedish friends, I don’t really get any chances to talk with them and they’re a bit too used to speaking English with me. And I really don’t know if I ever get the chance to spend time in Sweden again and to find Swedish friends who would be passionate about the same things as me and want to have sophisticated conversations about them with me. It sounds slightly far-fetched. Even when I lived in Sweden for a while, I only made a couple of Swedish friends. One of them was a cat. We haven’t been in touch lately. I guess somewhere deep inside I’m just thinking that perhaps, if I keep learning the language, someday I will get the chance to make friends I wouldn’t have otherwise, friends with whom I can discuss languages or scouting or what have you. That’s one of the reasons I’m into learning languages in general. You never know who you’ll meet! However, another wise thing Kestin Cable said in her podcast was that if you don’t put yourself in a situation where you need C1 level of a language, you’ll never reach that level. So just hoping I’ll need it someday isn’t really going to help me get to that level. And I really want to find a reason to need C1 level Swedish. Which brings us to my goal for Swedish learning in 2018. My goal for 2018 is to find a reason to need C1 Swedish. That means I’ll actively look for as many different forums and situations as possible, related to the things I normally do, such as my job, scouting or language learning, in Swedish. So not just find a language exchange partner or a tutor, but to connect with Swedish-speakers with similar interests, people who might have some interest in speaking with me for other reasons than helping me learn the language. Sounds simple, but I think it might be tricky to do in practice. Have you been in a similar situation, where you have to actively create yourself the need to use a language on an advanced level? How did you manage? Let me know in the comments! After reviving from hibernation, I already promised I’d write a Clear the list post for March. However, I didn’t manage to make one because I had no idea what my goals for March should be. I still hadn’t figured out what I even want to achieve this year. And before I could figure that out, I had to review what I actually did last year. Now I’ve finally had time to process it, and figure out where I am and where I want to be going next. Dabble a bit in a new language – one I’ve had my eyes on for a while, and now the time feels right. Now, actually a fourth thing is, I want to write this blog more often. I just have this bad habit of writing huge marathon posts that take three hours to finish. So, to start working towards making shorter posts more often, I’ll break this learning goals for 2018 into three parts. Part one is about my main goal: to improve my Russian. I feel most motivated about improving my Russian right now, so that’s what I mainly want to concentrate on. I tried to identify my current level and would say I’m somewhere between A2 and B1. More B1 in listening and spoken interaction, but definitely more A2 in spoken production, writing and reading. It’s interesting – in other languages, reading has been the easiest part for me, but reading in Russian feels quite difficult. Probably due to the different script? Anyhow, I think the place between A2 and B1 is the sweet spot of language learning, where you’ve started to get your head around the language but your progress still hasn’t slowed down too much. Perhaps that’s partly the reason for my motivation to keep learning Russian right now: I feel like there’s most to achieve there, with least effort. You should make hay while the sun shines!, right? I’ll try to set my monthly goals based on this bigger picture, focusing on one goal per core skill at a time. My main focus will be on speaking and I’ll pick one of the four speaking related goals as kind of a theme for my learning each month, and link the other three core skills to support my speaking practice. For example: I think in April I’ll focus on practicing to describe my experiences and thins that happen in my everyday life. I’ll link that with writing diary entries and watch some vlogs to support that. Additionally, I’ll start working through my textbook to get some structure to my studies. Now, I’ll REALLY try putting together a Clear the list post for April to break these goals down into more concrete steps and show you in more detail, what kind of learning methods I’m planning on using. Is it worth reviewing what happened in 2017 when it’s March already? At first glance, when looking back and comparing my language learning years 2016 and 2017, I kind of felt that 2017 became a real pannukakku – a Finnish expression that is used to say that something kind of failed (which is really super weird actually: pannukakku means pancake, and Finns love pancake). In 2016, I started to learn languages again after several years’ break, developed really active routines and started setting goals and tracking my learning habits. 2017 started out nicely, but then life happened: thesis, a new job, a huge amount Scouts volunteering… And by November, my language routines and habits were almost gone. This was my picture of how my 2017 in languages was, and at first I thought it’s not worth reviewing in more detail how I did with my goals for 2017. Not when it’s March already. But then I decided to at least have a look at the post from January 2017 to remind me of what my thoughts had been in the beginning of the year. And after having a look, I decided to share what I found. So here we go, a (rather long!) review of my 2017. I’ve included quotes from my different Clear the List posts throughout the year to show exactly what a pannukakku of a year it was..
My Instagram #bestnine from 2017. January–April: Where can my get my Russian in four months? As in the course of autumn I gradually dropped almost all Russian learning activities, I’d actually already forgotten about how much Russian I learned last year. Now that I look at my Clear the list posts from last spring, I’ve gotten an unbelievable amount of learning activities done each month. Looking at my Instagram videos from January, the difference to later videos is huge. I spoke very slowly and very simple sentences in the beginning. And if I look farther back, I can remember the feeling of starting out the tandem meetings (that was in late 2016), and how badly I struggled even with the simplest conversations. And then the feeling, some time in the early summer, when I had a meeting with my tandem partner, we’d go to a cafe at a beach, and sit in the sunny terrace sipping cold lemonade and chatting about my trip to Paris later that summer, about what I wanted to do there, and about what was best about travelling… in Russian, that is. I’d say I moved at least from level A1 to A2 in half a year. Which, of course, is not very fast progress, but it’s definitely progress! Finding a French tandem partner and having was definitely one of last year’s language learning victories. It didn’t even take that long to prove myself that I’m quite able to have a decent conversation in French! I did struggle a lot and often lacked the vocabulary but with a patient and helpful conversation partner, I dared to try and discuss even things I never would have imagined possible with my French level. July: “My goal was to just defrost my Swedish, which felt really rusty. That goal isn’t very well defined, but I could say I’ve reached it already. I’d say some defrosting has happened since January, just by reading some books in Swedish. Now, after just a few weeks of more active practice, I feel like I’m almost where I left when my Swedish was at it’s best. Of my languages, Swedish is the one where I’ve most felt like I failed with my goals last year. May and June ended up being the most stressful time regarding finishing my thesis, so my Swedish summer didn’t really get going like I planned. In July, August and September, I tried to go for immersion at home (the kind that Katie Harris has so inspiringly written about!) but ended up having less and less time for language learning as the months passed, and losing my routines altogether. However, if I look at my goal from January, it was to defrost my Swedish and get back to the level where I was after upper secondary school. And already in July I’ve written that I actually did do that! Then I ended up moving my goals forward. And the new goal just wasn’t really well in line with other stuff in life. And I hadn’t even really properly considered what reaching that goal would require. But setting that goal and trying it out actually showed me what it would take to “take my Swedish to a new level”. I’m now more aware of where I am and what are the areas I need to develop. You wouldn’t call that a failure, would you? As I’ve described, I ended up focusing on Swedish longer than I’d planned. The time wasn’t right for a new language. And then I ended up in my language learning hibernation and didn’t really put any effort at all into developing my revision routines. So how was my 2017 in languages? Well, if you’ve read this far, you probably noticed: It wasn’t that bad. And it was definitely worth reviewing. I was reminded about how many little victories there actually were last year. I improved in all of the three languages I was learning, or at least brought them back to more active memory. And there was a lot of speaking in all three of them, perhaps more than ever before. That’s no small thing. In 2016 I struggled a lot with speaking any of them. And another lesson I learned: Clear the List is so worth the time and the effort. Not just the goal setting part, but the monthly review as well. By looking back at the entire year, I was able to get the big picture of how much progress I’d made, which can be life-saving for motivation. I was also able to reflect on what worked and what didn’t. This will help me improve as a language learner. To be honest, I started writing this as a “goals for 2018” post at first, but then got carried away looking back and had to change the title. But I think I needed this. I hope it will help me set better goals this year! Did you ever feel like you need to hibernate? I feel the need every year, it hits me around November. And I think year after year, it gets stronger. I want to drop all my projects and things that usually bring me joy – and just sleep. Last couple of years, it has been a bit easier to cope with it though, for one simple reason: I’ve given in to the need. No, of course I didn’t really crawl under my blankets after eating my stomach full of pine needles like the Moomins, and then sleep until the first warming rays of late February sun. I just took it a bit more easy; accepted the fact that I did not have the energy for everything I would have liked to do. As I had to have energy for my job, some time with my family and friends and a fairly time-consuming volunteering position, I decided it was better to quietly give in to a language learning hibernation, than keep pushing it and go straight into a language learning burn-out. It was kind of a deep hibernation – like a little hedgehog that wakes up every once in a while to keep alive, I would occasionally read something or listen to something in one of my languages, but I didn’t make an effort to set goals, really keep up proper habits, track my activities or really give it much thought at all. But now the sun rays have started to creep through into my nest and I feel like I might start to revive. I think it wasn’t just the increasing light, though, that woke me up. It was also the Russian language. I found the habit of audiobooks again, and then some Russian music, and one day I was walking home and listening to a particularly beautiful song that was new to me… And I was struck by the feeling, that I need to learn more of this language, I want to speak it again. So here I am, slightly late for the usual new year’s resolutions, but all the more ready to start planning another year in languages! More about that in a Clear the List post for March! This year, it was still snowing at the and of April and now the dark, rainy part of autumn rushed in the moment October began, and I found myself feeling as tired as I usually would in the darkest days of November. Oh well, to even that out, the autumn colours couldn’t be more beautiful than they are this year. Always look on the bright side. This post is inspired by the Clear the list challenge hosted by Lindsay Williams from Lindsay does languages, Shannon of Eurolinguiste, Kris Broholm and Angel Pretot. As I predicted, September wasn’t the best in terms of routines – quite understandably, as life was on the doorstep of a new phase. I graduated and didn’t yet know what would happen next. And there was the week-long trip to Iceland, which was obviously a break from all the routines. My main goal for September was to learn some Swedish every day (except while in Iceland), and I pretty much managed that, until… The week after Iceland I got a job (!!!) and that started the last week of September. Well, you can guess – starting a new job means a lot of learning and new information. There wasn’t much energy left for anything else. So all in all, there was only two weeks of efficient Swedish learning in September – but those weeks I’m quite happy with, mainly because there was more speaking involved than ever. I had a chat on Skype with my new tandem partner several times a week – just for ten to twenty minutes, but still, I already feel a lot more confident about speaking. As for listening, which is usually the easy part – that has been suffering from the fact that I have too many alternatives and can’t seem to decide so I end up doing nothing. I’ve been listening to several podcasts, and choosing which podcast and which episode to listen to hasn’t worked out for me. Writing I’d decided not to worry too much about – and I basically didn’t do any writing at all. For reading, I had two books, a novel called Där vi en gång gått by Kjell Westö and the behavioural science (or “science”) book Omgiven av idioter by Thomas Eriksson. I actually put the former on a break and only read the latter. I didn’t get through the whole book, though. To be honest, the book was a disappointment, I didn’t find it interesting at all. It was full of annoying and stupid oversimplifications and generalisations. I had to return it to the library before I managed to get half-way through it and I couldn’t loan it again right away because there is such a long queue of reservations to the book… But I say good riddance. Boo. For Russian, my goal was to have two tandem meetings, which I did, and start listening to audiobooks again, which I didn’t. And for French, I just said I’d keep reading my light airport novel – and I read just a bit, maybe once or twice. I also sort of had the goal to write something on the blog between these Clear the list posts. And I did! I wrote about my impressions of the Icelandic language during my visit to Iceland. So, not a month of amazing accomplishments, but it was ok. Now, as you could perhaps already tell, there are a few things I’ll do a bit differently this month. Because my new job is still new and a bit overwhelming, and I have a whole new routine to create as my weeks have now become a lot more regular that they have been during my student days, I’ll take it easy this month. I still aim for a bit of Swedish every day, but really just a little will do. I aim for 5-15 minutes every day. Listening during bus trips and when I go for a walk or jogging (another habit I’ll try to re-establish), and maybe sometimes when I tidy up or cook at home. I’ll go for an audiobook when I go jogging, and podcasts on the bus and at home. Produktivitetsbloggens podcast whenever there’s a new episode, and Respodden otherwise. There, now I won’t need to make the choice later. Writing my diary. I have a five year diary and at times I’ve been writing in it every day, but this whole year I’ve struggled with that habit. Now, one more attempt. Having a Skype with my tandem partner after work – we’ll see how often we manage to schedule this, but I’m hoping for a couple of times per week. Reading… Hmm. I’ll go back to reading Där vi en gång gått, but I don’t know where and when I could stick to the habit of reading a bit. Reading just before bedtime doesn’t work for me, I’m always too tired in the evening. But I guess I’ll start carrying the book around with me and trying to find a place and time for that habit. What’s really exciting is, I might also actually need my Swedish at work! I actually already had a task that involved reading some documents in Swedish. And Danish, mind you! Haha. Seriously, though. Apparently I can read Danish quite decently (as long as you don’t ask me to read it out loud!). With Russian, I’ll try to have two tandem meetings again. And listen to some audiobooks the weeks I don’t have a meeting. Aaaand I’ll read my novel in French if I feel like it. And I’ll try to write at least one blog post before November’s clear the list. There. My plans for October – slightly less ambitious but still moving forward. We’ll see, where these little steps will take me this month! I’m also preparing to take it even easier if I need to, as it gets darker and colder and I get more tired towards November… I’ve realised the secret of surviving the dark time of the year is to accept that I can’t manage the same amount of stuff, as less daylight means less energy. This post is a bit different to usual – it’s not about the languages I am currently learning. It’s almost a sidetrack to travel blogging, but not quite. I’m going to write about my impressions of the Icelandic language, without having actively learned any of it, but after having experienced it as a part of my trip there. Before my trip, I made the decision not to make any efforts to learn Icelandic beforehand. The decision about the trip was quick and quite last minute so I wouldn’t have had time to learn much anyway, and I don’t feel like dabbling into languages right now. I did, however, kind of check the language out as a part of pre-travel hype by watching a few videos of basic phrases and by listening to a couple of Disney songs (that was bizarre! :-D), but my aim wasn’t really to memorise anything. Just to get the feeling of it. And when in Iceland, of course I didn’t want to close my ears and eyes and mind from the language. I didn’t ignore it. I was very much observing it, every time I had the chance. The thing is, even if you don’t actively want to learn the language before your trip, travelling is still always an interesting opportunity to explore a new language. It’s a chance learn understand some things about the language even if you don’t learn to understand it. You’ll learn, that it is possible to appreciate and enjoy a language completely strange to you, one the you don’t speak a word of and perhaps even have no intention of learning (at least at the moment). All you need to do is keep your ears open and mind tuned to a language learners’ mindset. That’s what I did in Iceland, and I wanted to share some thoughts about it: four ways I was exposed to Icelandic while traveling, and five things I learned about Icelandic just like that. We rented a car for three days and one of the first things I noticed when we hit the road wasn’t any breathtaking view through the window, but the language that was flooding our ears from the radio. It was a wonderful combination – listening to the language, the radio host chatting, the advertisements, occasional Icelandic song even, and simultaneously watching the views change as we drove on. Experiencing Iceland with our eyes and our ears. One thing I slightly tried to learn beforehand, or at least on the flight to Reykjavik, was how to pronounce Icelandic. They have some letters of their own, and some vowel combinations are pronounced differently. There was a small introduction to these in my guidebook. It felt rather difficult. However, once we got to Iceland, we kept trying to read the road signs and place names out loud, and kept re-checking from our guidebook for the right pronunciation, and soon I started to remember that “au” is actually “öi” and à is au. We had two awesome days riding the Icelandic horses, and the riding guides told us a lot about the area and also explained the meanings of the place names (and the names of the horses, too!). This was a way more interesting guided tour experience than any Hop on-Hop off -bus tour ever! This sounds worse than it is. Of course I could not understand what the people were saying, so I have no reason to feel guilty! One fun way to explore a language is to listen to the locals, of course. In Iceland, there is one especially great place for this: the public swimming pools and hot tubs. We bathed somewhere almost every day, and while some places were more tourist-filled, we also visited a couple of places where the locals gathered to relax for their day off or after work. Even though you’d think peace and quiet is what you appreciate in a place like that, the calm and steady chatter of Icelandic was actually a very pleasant background sound. Just relaxing in the hot water while wondering this amazing, special element of the Icelandic culture – again, hearing the language made me feel more connected to the culture; the experience feel more real. While listening to the radio, I soon noticed that if I didn’t pay attention, I could imagine it was Finnish on the background! Amazing. It felt also a bit the same as listening to Estonian, which really is related to Finnish: I don’t understand a word but the melody is similar. Icelandic and Finnish are not related at all, but still, there is something very familiar to the sound of Icelandic. This is due to the way the words are stressed in both languages: the stress is on the first syllable. Like Finnish, Icelandic rolls on in a steady way, without a sing-song variation to it. Also, I guess there are some similar weird combinations of vowels (which can make a native Romance language speaker quite uncomfortable? :D). Sometimes, I could clearly connect an Icelandic expression I read somewhere, to its Swedish counterpart. Often however, it took a few times of reading or hearing before I could make the connection. Sometimes I couldn’t figure it out at all. Icelandic is too different from Swedish that knowing the other would really help understand the first. Often for instance the place names seemed incomprehensible when you first saw them, but after getting the pronunciation part right, they suddenly made more sense for a Swedish speaker: for instance, once I realised ‘Rauðá’ is pronounced ‘Röid au’, and it means Red river – which would be Röd å in Swedish. For me, Swedish has always had “a language of campfires and storytelling days” feeling to it, but in comparison, Icelandic is like the language of heroes and ancient legends version of it. When I tried to look for the connections to the related language I know, I could kind imagine to feel the “Vikingness” of Icelandic. Reykjavik = steamy bay, Reykjadalur = steamy valley. Both are areas with hot springs. Hveragerði = Gardens of the hot springs. There are a lot of hot springs and a lot of greenhouses. You get the idea. Even the horses where named things like Hvita = white (a white horse), Stjarna = star (a horse with a white star on the head), Eldur = fire (a chestnut red horse). So things are basically called exactly what they are, and just buy learning Icelandic place names (or horse names!) you can learn a whole lot of vocabulary. Awesome! Somehow also I think this reflects in a beautiful way the straightforward, uncomplicated relationship the Icelanders have with the nature. It simply means ‘yes’ (it’s pronounced /jauː/), but by the end of the trip, hearing this word really made me smile. I heard it a lot, and I can’t really explain why, but it sounded really heartwarming. Somehow happy and positive. Once I started paying attention to it, I heard it all the time. These were my scattered, very un-linguistic impressions of the Icelandic language. Even though I didn’t really learn any of it, I gave it a lot of thought during the trip, and together with the interactions with the locals, the beautiful landscapes, the food we tasted and the freshness of the air we breathed – it was an important part of making memories of Iceland for all senses. I really think that even just observing, if not learning, the languages of the countries we travel in, really give an extra dimension to the travel experience. Have you ever done similar ‘language observing’ while traveling? How do you observe and explore a language while traveling? Or do you always try to learn some basics of the language before you go? I’d love to hear your thoughts! Ah, September – one of my favourites! The feeling of freshness both out in the nature and in life in general. Right now there is even more anticipation than usual, as I’m turning a whole new leaf in life: I graduated! It’s time to say goodbye to student life and welcome something new. What exactly, I don’t know yet, as I’m currently searching for a job… But I feel positive and excited. As I wrote last month, August attacked me kind of suddenly – and it didn’t give me an easy time the whole month, really. I caught a cold and was sick for a week, and even without that, I had a lot more eon my plate than I’d expected and it ended up being like a marathon of months. Everything I had to do was really motivating and exciting though! However, it meant that my language plans had been slightly too ambitious, as I’d overestimated the time I could spare for language learning. So it was the third month in a row of doing less than I planned, but I’m not too disappointed. I’m still sort of experimenting with what kind of routine I could have for Swedish, and each of these three months I’ve still studied more than the previous month, and managed to make it a little more consistent. I’ll have to tune down my goals from last month a bit, but I’ll still try to study a bit more than last month! For Swedish, my goal was to aim for immersion, and read, write, speak or listen a little bit every day except weekends, so I’d do all of them a few time every week. I basically had one week when I can say I did this. The other weeks I did a fair amount of listening, read a little, and that’s it. Listening – I listened to a lot of music and quite a few podcast episodes. Reading – I read some 50 pages of Där vi en gong gått, and once I read some articles about circular economy and wrote down useful words. Writing – I only wrote maybe two entries in my diary. I don’t know why this is so hard to get going. Speaking – Meh… I had one Skype with my new Tandem partner. I spoke a few times on my own while driving somewhere. And did two short videos on Instagram. I don’t mind too much doing less than planned for the other parts, but I really want to improve my speaking, and at this rate, much progress isn’t going to happen! As for Russian, I met with my tandem partner twice and that’s all. This is ok, but the tandem meetings were more enjoyable when I was being more consistent with other Russian practice, too. Using my Russian now feels a bit like I’m taking it out of the fridge each time; it’s all stiff and sticky and needs to be warmed up before it starts to flow like it should. Oh well, I guess it’s good practice anyway! For French I didn’t even have any specific goals, I only read some more of the book I bought from Paris airport. I don’t really know in detail what I’ll be up to this September. For now, it’s job search and hopefully some chill. All I know for sure is I’m off to Iceland for a week (woop!! ), a rather spontaneous trip with a friend of mine. So not too much time for language studies that week. It would have been a chance for a little side track language adventure – Icelandic sure is an interesting one – but well, I’m not really into language dabbling right now, and anyway I only decided to book the trip two weeks ago… I think just góðan daginn and takk fyrir will have to do this time! After my trip, I guess I’ll also review my goals for the rest of the month a little bit, when I know more about my situation and plans. 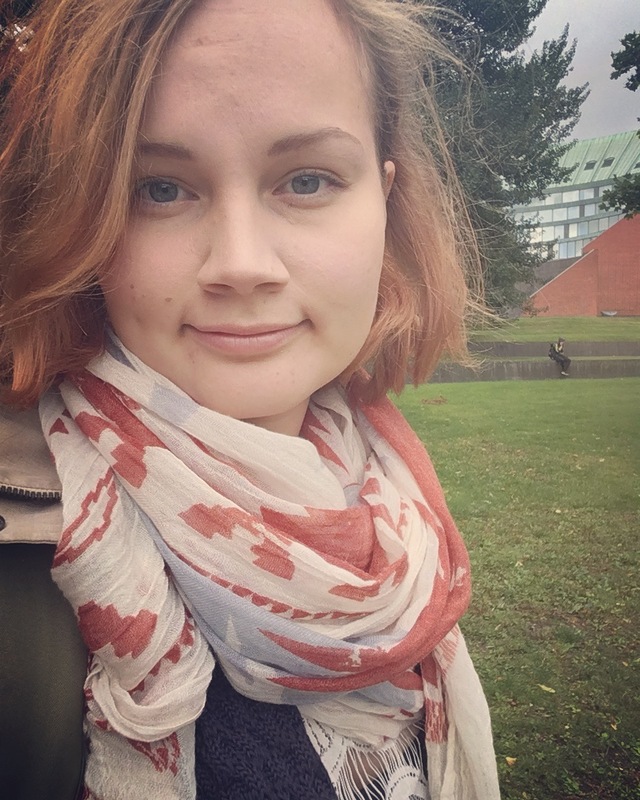 I’ve teamed up with Elena as language buddies for Swedish – which I’m really glad about! I’m quite sure chatting with her will help me get back on track after my trip. I’ll still stick to the attempt of some every day Swedish. But whereas last month I was trying to fit an hour of studying to my days, now I’ll settle for just doing something every day, and try to practice each of the four skills once at least once a week. I’ll keep reading Där vi en gång gått, but as it’s a bit of a heavy read, I also got another book alternative: Omgiven av idioter by Thomas Erikson. It describes a personality analysis system where all people can be sorted to four categories, and how this can help you understand people better, even the ones that are very different than you. I’m not sure if it’s very well based on scientific facts, but it’s a popular book, and should be an interesting read. I’ll keep listening to music and podcasts, for now I’m happy with the ones I mentioned in last month’s post. I don’t really lack alternatives for speaking practice, I just didn’t utilize them last month: italki tutors, my new tandem partner, some friends I could Skype with… This month I just need to book these well in advance and stick to them. At least one real speaking practice session per week is my most important goal this month. I don’t know how I could motivate myself to write more often… but after all, it’s not the most important skill for me for now, so I won’t worry too much about it. I’ll write something if I feel like it. For Russian, I’ll try to manage having two Tandem meetings, and I’ll try to start listening to audiobooks again. For French, I’ll keep reading my airport novel. Well, maybe it already helps if I hereby promise to write at least one post before the end of this month! So – nothing too new and exciting for my language plans this month, but I guess is good to have something familiar in this new situation I’m in! 🙂 Maybe when other things in life start to find their course again, I can shake things up a little and think of something new. We’ll see!